KANSAS CITY, Mo. 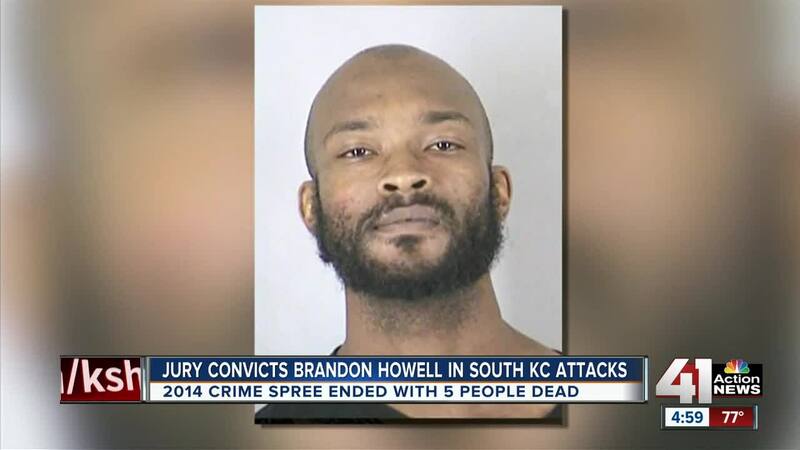 — It took a jury less than two hours to find Brandon Howell guilty of all 11 counts he faced in a deadly crime spree carried out in a tight-knit south Kansas City neighborhood in 2014. "It is the right verdict, but I never take it for granted until I hear those words spoken in a courtroom," Jackson County, Missouri, Prosecutor Jean Peters Baker said after the verdict. According to court documents, Howell severely beat George and Ann Taylor while trying to steal their vintage car. The older couple died later at the hospital. Howell took another car from the Taylors and then stopped in front of neighbor Susan Choucroun's home and shot her, according to court documents. He also shot and killed Lorene Hurst and her son, Darrel Hurst, as he drove off in the stolen vehicle. Police arrested Howell walking along Interstate 29 in a different part of Kansas City. Since that day in 2014, Baker said she has stayed in close contact with the families of Howell's five victims. "Behind the doors here, there's a sizeable group of people with broken hearts, but they know justice is there for them," Baker said. Loved ones of the victims packed the sixth-floor courtroom during the week-long trial. "It's been hard and emotional reliving it," said Ronald Sandhaus, the brother of Susan Choucroun. "It's just an empty place, just an empty place in our hearts," said Barbara Fountain, a friend of the Taylors. The verdict handed down Monday was a relief for many. "There's a solid assurance about what's going to happen now, and that's Brandon Howell won't be able to hurt anyone else again," Baker said. A sentencing date for Howell has not been set. Howell also was accused of murder in the 1998 murders of two Shawnee teenagers. He was acquitted of those charges in 2009.